Yet another easy to use amassment of useful information at your fingertips. 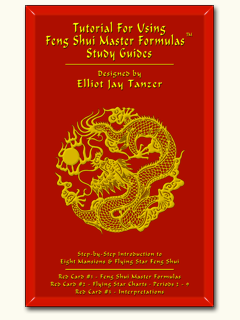 This Study Guide will assist you to quickly reference the interpretations of the Eight Mansion and Flying Star Formulas. Here you will find the meanings of the four Best and four Least Favorable Directions, all the Flying Star two number combinations, the Three Afflictions, the three Five Element Cycles, and much more. All of the essential information needed to interpret Flying Star and Eight Mansion Feng Shui formulas have been carefully collected from many books by Lillian Too, Eva Wong, David Twicken and others. All this and many other reminders on two sides of an 81/2 x 11 laminated card.